We are solving series of problems based on the concept rotational dynamics. Moment of inertia is a physical quantity that measures how difficult it is to rotate a body about a given axis. This is similar to mass of translatory motion. Moment of inertia can be defined as the summation of product of mass of each particle with the square of the distance from the axis of rotation. 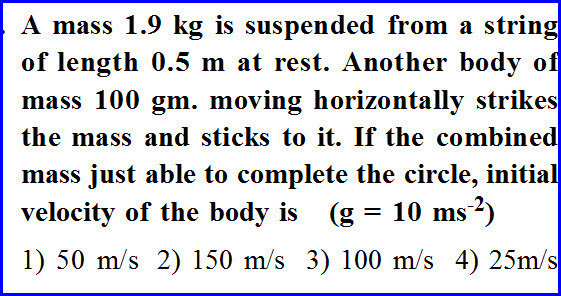 It depends on the mass of the body and axis of rotation of the body. To over come this moment of inertia, we need to apply torque which means turning effect. 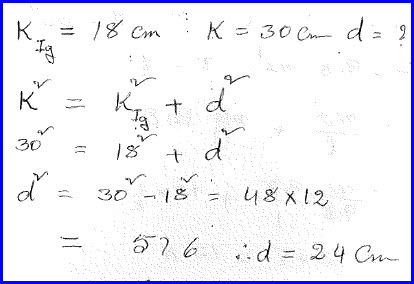 It is cross product of distance of the body from axis of rotation and the force applied. A mass 1.9 kilogram is suspended from a string of length half meter and it is at rest. Another body of mass 100 gram is moving horizontally strikes this mass and sticks to it. 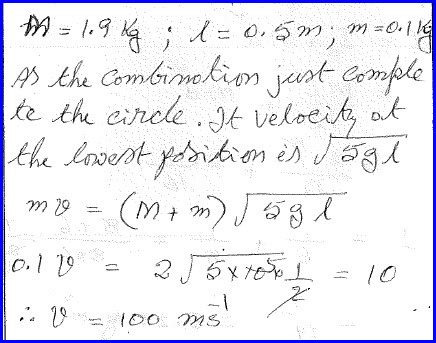 If the combined mass is just able to complete the circle, we need to find the initial velocity of the body. Problem is as shown in the diagram below. The kind of collision after which both the bodies moves together is called inelastic collision and here both the bodies moves with common velocity. For this combination to move and complete vertical circular motion, it shall have some minimum velocity at the bottom and taking that into consideration, we can solve the problem as shown in the diagram below. We have applied law of conservation of linear momentum to the given data as shown. 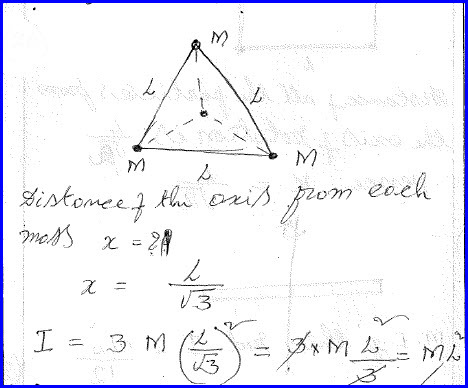 Three point sized bodies each of same mass are fixed at the three corners of of triangle. We need to find the moment of inertia of the system about an axis passing through the center of frame and perpendicular to the frame. Problem is as shown in the diagram below. Each particle is at a distance from the axis of rotation and it can be found using basic geometric principles. All of them are identical with axis and hence moment of inertia of the system is the sum of each of them. Problem is solved as shown in the diagram below. 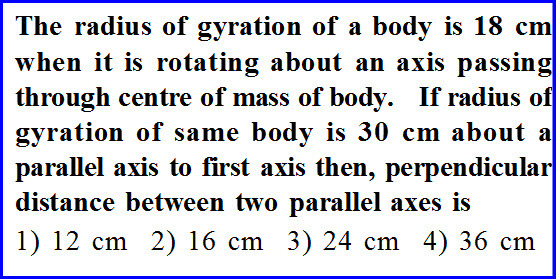 Radius of gyration of a body is 18 centimeter when it is rotating about about an axis passing the center of mass of the body. 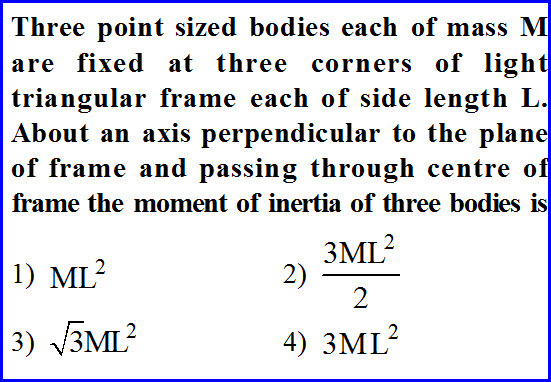 If radius of gyration of the same body is 30 cm about a parallel axis to the first axis, then we need to find the perpendicular distance between two parallel axes. Moment of inertia of a body depends on the axis of rotation and it changes with that. 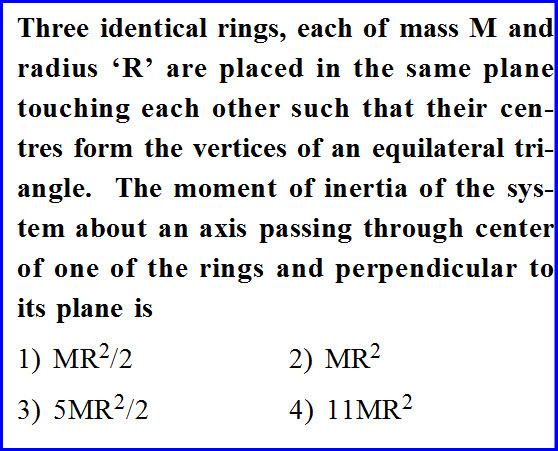 To find the moment of inertia of one axis that is parallel to another axis, we need to use parallel axes theorem. According to that theorem we can write statement as discussed in the chapter and further problem can be solved as shown in the diagram below. Three identical rings each of mass m and radius r are placed in the same plane such that each one ring is in touch with the other two. We need to find the moment of inertia of the system about an axis passing through center of any one ring and the axis is perpendicular to the plane. Problem is as shown in the diagram below. We know the moment of inertia of a ring about an axis passing through the center and perpendicular to the plane as a standard result. Other ring axis is a parallel axis to the first axis and their distance of separation is 2r. We can apply parallel axes theorem and find the moment of inertia of other two rings and the moment of inertia of the system is sum of all of them. Solution is as shown in the diagram below. 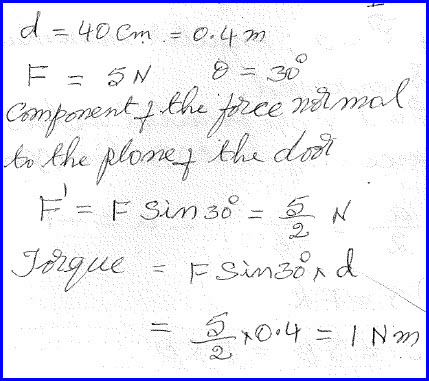 The handle of a door is at a distance of 40 centimeter from the axis of rotation. If a force of 5 newton is applied on the handle at a known angle, we need to measure the torque generated and the problem is as shown in the diagram below. We know that the torque is turning effect and it is the cross product of force applied to the distance of the particle from the axis of rotation. By applying that concept, we can solve the problem as shown in the diagram below.